Welcome To/Bienvenidos A......: Wow! Sorry I've been gone so long! The end of the school year must have thrown me for a loop! We have had VBS, & a week's vacation for Dave & I already. (plus various & sundry other activites for all the kids). 3. Finish registering Nat for school. 5. Register the girls for dance next year. 1. Grade Ana's math up to now. 3. Go through one shelf of games. 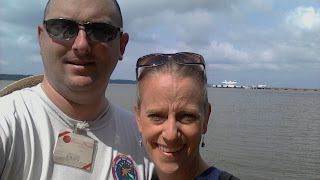 Dave & I at Historic Jamestown. Looking out over the James River, which feeds into the Chesapeake Bay. You can see a ferry boat behind us.